Have you ever found yourself being ignored by someone and you have no idea why? A narcissist will deliberately ignore their target in order to cause harm, often encouraging others to do the same (Ostracism). What have you, the target done to deserve being ignored? More than likely nothing of any significance. A narcissist will react to any perceived slight, real or imagined with any punishment that they deem fits your crime, the silent treatment being a favourite in their arsenal. We all have an inherent need to belong. To be shut out especially by those we love, is debilitating even to the strongest of people. By being ignored or ostracised, we are left feeling worthless with our self-esteem at an all-time low. 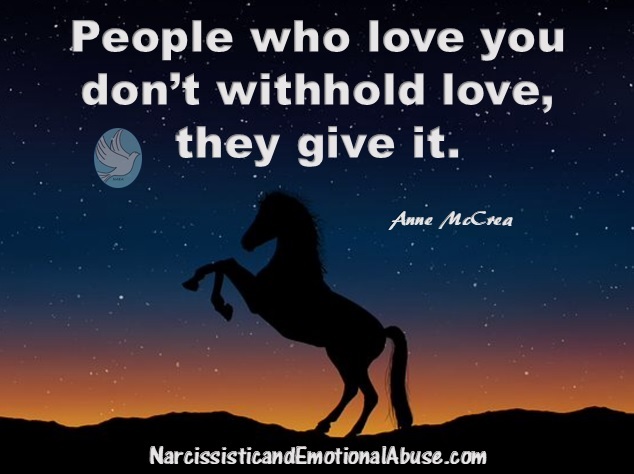 The narcissist will express their disapproval by shutting down, withdrawing any love or affection, refusing to communicate and denying their target any explanation. Why? Avoidance, control, disempowerment and / or punishment, punishment for some perceived slight that their target is completely unaware of. They know how they are making the other person feel but in their sick and twisted mind, they believe that somehow they deserve it. Their emotional maturity is typical of a five year old child who sulks and storms off until they get what they want. (Don’t confuse the silent treatment with no contact which is a process undertaken to protect ourselves, to give us time to heal and recover, not to punish or hurt anyone). How does a narcissist expect you to react? A narcissist wants the target of their abuse, and be in no doubt their silence is abuse, to reach out, plead and beg for their very existence to be recognised. Responding in such a way will give the narcissist their much needed narcissistic supply. The narcissist will read all your texts and emails and will get a tremendous amount of satisfaction from them. Oh, how it makes them feel important! It is perfectly normal, for a target of this form of abuse, to reach out in an attempt to resolve the situation. Your phone calls will likely go to voicemail, your texts or emails will be ignored. All your attempts at communication will be met with a deafening silence. This passive aggressive behaviour is usually a repetitive form of emotional abuse which the narcissist will practice time and time again with each episode of silence often lasting a little longer than the one before. This is intentional manipulation which conditions the target for future mind control. What these people do not anticipate is your knowledge of their twisted mind games. They don’t expect you to know how to play these mind games better than they can. Instead of crawling back to them, let them crawl back into whatever hole they have created for themselves and give them a taste of their own medicine. How do you play a narcissist and play better? Don’t give them their desired result. Don’t beg and plead to be recognised. Let their silence teach you something. Let this deadly silence teach you that you can carry on without them. Use this period of silence as a time to re-evaluate your position. Don’t waste your time trying to figure out what you’ve done wrong. I know you want answers but don’t chase them for any. They know that by not getting an answer from them, you will likely start blaming yourself. You’ll apologise when you’ve no idea what you’re apologising for and try to do everything right this time, until the next time. Don’t play into their hands. If a narcissist sees that they are not getting their desired response, this particular period of silence is likely to come to an end. However, bear in mind that if a narcissist believes this particular form of manipulation isn’t effective as far as you are concerned, they may switch to some other manipulative tactic. Respect yourself enough to know that someone who loves you would never treat you in such a contemptuous manner. People who love you don’t withhold love, they give it. People who love you have your back. They don’t stab you in it. When someone gives you the silent treatment, return the favour, walk away, close the door and lock it behind you. I loved the silent treatment , six years and did not have to put up with the nasty remarks. Yes it was uncomfortable at family gatherings. But just ignored the bad behavior. The reason she would not talk to me is because I called her on her bad behavior. The problem is the vicious lies that have popped up lately. So just did the silent treatment right back at her. She still doesn’t get it. It is what it is, what it has always been, what it will always be. Sorry. But I think this approach is naieve and possibly dangerous. To the narc this is further injury. They will accuse you of ignoring them, blame you for the silent treatment. This approach you describe is likely to lead to an esculation and further abuse. It’s not that simple ..
Is it effective? Thanks for sharing, knowing that im not alone in this kind of situation is enough for me to deal with them. After a years of the silent treatment I eventually told my husband that i welcomed the silent treatment. I then did not need to answer his bombardment of questions or accusations it was bliss. Three years and counting, this time around. (many previous rounds) I called him on the fact that he stopped wearing his wedding ring but put on his ring from a previous marriage to wear to a class reunion of sorts. I told him I thought he threw it in the lake (at a cousins reunion). Consequently I’ve been shunned ever since. The part that bothers me most, besides the fact that he’s stopped talking to our grandchildren, is the lies he tells his family to make himself look good in their eyes. I’ve been told that I’m the black sheep by a distant family member when he overheard their gossip.